"Bull" Halsey is best known for victories against the Japanese in the Second World War as fleet commander in the South Pacific and his slogan of "Hit hard, hit fast, hit often." Born on October 30, 1883, in Elizabeth, New Jersey, the son of Captain William F. Halsey, Sr., U.S. Navy, "Bull" was given his appointment to the Naval Academy by President McKinley in 1900. During the First World War, he commanded destroyers that escorted convoys across the Atlantic, which was regularly patrolled by German U-Boats. The next stage of his naval career began when, at the age of fifty-two, Halsey became a naval aviator in 1934. From that point on, he became a leading advocate of carrier warfare. He was quickly assigned successive commands of carrier divisions during the late 1930s and early 1940s, earning promotions at each major command position. Sea duty on the USS Enterprise prevented Halsey from responding to the attack on Pearl Harbor; however, he aided in the first major U.S. retaliation, the famous April 18, 1942 "Doolittle Raid" on Tokyo. The following October, Admiral Chester Nimitz appointed Halsey commander of the South Pacific forces and the South Pacific area. His command of the South Pacific theater, especially his command of forces that captured Guadalcanal, Bougainville, and other key islands in the Solomon Island Chain catapulted Halsey to fame. In late October 1944, he served as Admiral Nimitz's tactical commander for the Battle of Leyte and helped destroy the Japanese Navy. As the war in the Pacific drew to a close, Halsey's fleet participated in the invasion of Okinawa and he lent his flagship, USS Missouri, as the stage for Japan's formal surrender. 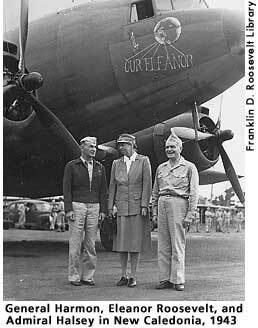 During the war he called ER a "do-gooder" and "dreaded" her arrival in the South Pacific to visit the troops. (1) Halsey's mind began to change soon after ER's arrival as he "marveled" at her work. Towards the end of her trip, ER was permitted to go to Guadalcanal and tour the battlefield and talk with the troops in and out of the hospital. She covered seventeen islands, New Zealand, and Australia, seeing by one estimation 400,000 troops. As she was departing for the United States, Admiral Halsey told her that it was impossible to express his feelings for what she had done for his men. Following the war, Halsey took the oath as fleet admiral on December 11, 1945, and became the fourth and last officer to hold that esteemed rank. Officially retiring from the navy on March 1, 1947, he accepted the position of President of International Telecommunications Labs, Inc., which he held until 1957. He died at Fishers Island Country Club, Connecticut, on August 16, 1959, and was buried in Arlington National Cemetery, next to his father. Joseph P. Lash, Eleanor and Franklin. (New York: W.W. Norton & Company, 1971), 684. Chambers, John W., II, ed. The Oxford Companion to American Military History. New York: Oxford University Press, 1999, 310. Lash, Joseph P. Eleanor and Franklin. New York: W. W. Norton & Company, 1971, 684, 688-691. Fleet Admiral William Frederick Halsey, Jr. : Frequently Asked Questions prepared by the U.S. Naval Historical Center.